Recently, a new world record was set for the longest paper airplane throw (video here). Obviously, I wanted to know how to make the plane for myself. The designer’s name is John Collins, and he has been working on this plane for four years. 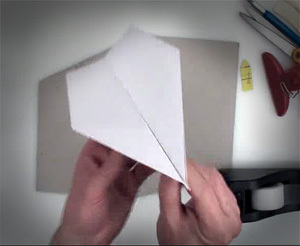 The plane design is called SUZANNE, and if you pay $2.99 over at thepaperairplaneguy.com you can watch a tutorial on how to make it. I did just that, but found that it requires A4 paper. Another quick search informed me that A4 is the standard paper size for every country in the world except the U.S. and Canada. So if you’re reading this from anywhere else, lucky you! Fold up your queer-shaped documents and let’em rip (pun unintended). And for those of you in America (and its hat), one of the many other planes John has invented is called The Stinger. It uses standard 8.5×11 and flies farther than any plane I’ve ever thrown. John’s video tutorial is great, but it requires a membership, and this is a down economy, so enjoy the free version.